Très bien, pas de fausse note. Muy bien situado en el centro! Apartamento amplio limpio y cómodo! Posizione perfetta e casa molto grande e spaziosa. This spacious four-bedroom apartment in the Eixample district is the perfect choice for your trip to Barcelona. The area offers the perfect culmination of history, art and culture as you will find yourself amidst some of Gaudí´s greatest architectural masterpieces as well as being within walking distance of Passeig de Gràcia- any shoppers dream! Wind down the narrow side streets lined with bars, cafés and restaurants. The city will be at your fingertips. This apartment is the ideal choice for groups of friends, couples or families and can accommodate up to nine people. The parquet flooring and oversized windows, which allows natural sunlight to shine in all day, is the ultimate choice for your home-away-from-home. Simplicity and comfort takes precedence in this space. The living room has a comfortable sofa and TV, perfect for relaxing after a day of sightseeing. An Internet connection is also available, making it easy to stay in touch with friends and family back home. The kitchen is well equipped with all of the utensils and appliances needed to create your own Mediterranean inspired home-cooked meal. The main bedroom has a double bed, with plenty of storage space. Two of the remaining bedrooms have two single beds, respectively, while the fourth room is furnished with one single bed. A double sofa bed can also be found in the living room. The apartment has 1.5 bathrooms: one full bathroom and one W.C. 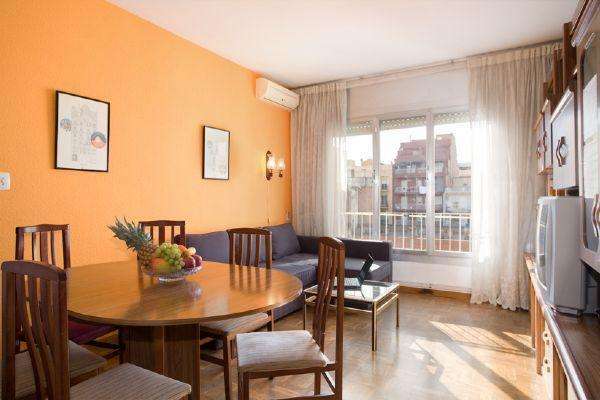 This comfortable apartment, complete with heaters and air-conditioning, is the ultimate choice for your trip to Barcelona, any time of the year.